Not long ago, the Santiago metro network was chosen as the best underground metro network in Americas. It is one of the largest metro network in the world, being the second largest among the Latin American countries. The metro operates on 5 lines, serving a total of 108 stations. It is well known for its large annual ridership, which reached a staggering 648.7 million in the year 2012. To meet such a large demand, the trains have to be in operation as often as possible. Therefore, it should come as no surprise to find out that it is ranked 7th in the world, in terms of frequency of trains. This network which began operations way back in the year 1975 is still in its expansion stage. As of now, two more lines are being constructed. The Metro S.A is the body that is responsible for the operations of this metro network. The metro has a different schedule for weekdays, Saturdays and Sundays and other public holidays. On weekdays the trains operate between 05:35-23;40. On Saturdays the trains begin operations slightly later at 06:30 am and run till 23:45 pm. Sundays and other public holidays have less flexible timings. The trains operate between 08:00- 23:30. The fare for the metro network is distinguished on the basis of the time of the day of travel. During the peak hours the ticket for an adult is priced at, $740, while during off peak hours, the ticket lies between $660-$610. Children and senior citizens are entitled to significant discounts. A ticket for them costs less than one-third than that for an adult. It is priced at $210. There is no street parking except on Saturday and Sunday. Most metro stations offer park and ride facilities to passengers. During rush hours, it is safe to keep an eye on pickpockets. The metro stations are also equipped with security personnel to ensure the safety of the passengers. Smoking, Drinking and Eating is prohibited in Metros except in the designated areas. The metro allows transit of small animals / pets, provided they are carried in a closed carrier. The metro stations are clean and have display of fine arts at various stations. ● Line 1 – Line 1 runs from west to east and the metro started operation in 1975. It offer service from San Pablo towards Los Dominicos and is the oldest network system that serves 27 stations. It is the most used line of the system and the line carries 897,000 passengers daily. Currently Line 1 gets connected with line 2, line 4 and with line 5. Line 1 is the red coloured line. ● Line 2 – Line 2 runs from north to south and the metro started operation in 1978. It begins service from Vespucio Norte and goes towards La Cisterna. The length of the line is 19.3km and it serves 22 stations along its way. Line 2 is the yellow coloured line. ● Line 3- Line 3 is a new line and it is due to open in 2018. The line plans to run from Huechuraba metro station towards the hospital Militar metro station. It will be serving 19 stations, when it begins operations. ● Line4 – Line 4 runs from northeast to southeast, beginning from Tobalaba and goes towards Paul Puente Alto. 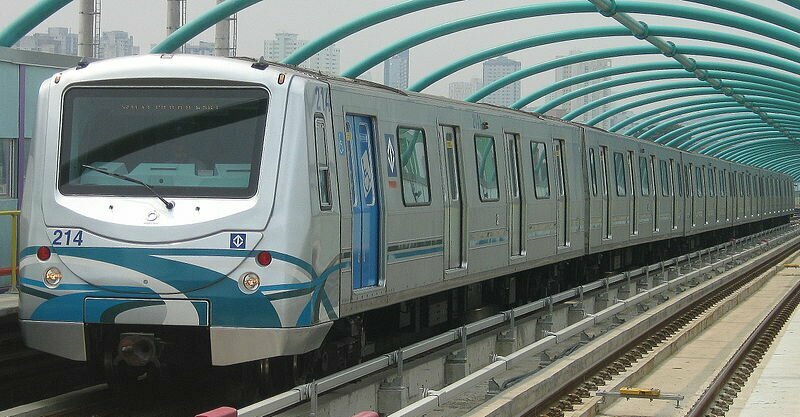 It began operations in 2005 and the line has a length of 24.7km serving 23 stations. The line intersects line 1, line 4A and with line 5 and is considered to be one of the most used subway lines in the world. Line 4 is represented by the colour blue..
● Line 4A – Line 4A runs from south to south east. It started operations in the year 2005 and it runs from from La Cisterna towards Vicuna Mackenna. The length of the line is 7.7km along which it serves 6 stations. The line intersects with line 2 and line 4. Line4A is represented by light blue, instead of blue..
● Line 5- Line 5 runs from southwest to southeast. It started operations in 1978 and the line begins from Plaza de Maipu, and runs towards Vicente Valdes. The length of the line is 29.7km , along which it serves 30 stations. Line 5 intersects with line 1, line 2 and line 4 and is represented by the colour green. ● Line6 – Line 6 is a new line that is due to open in 2016 and the metro is planned to run from southwest to east of the city. It is set to serve 11 stations. 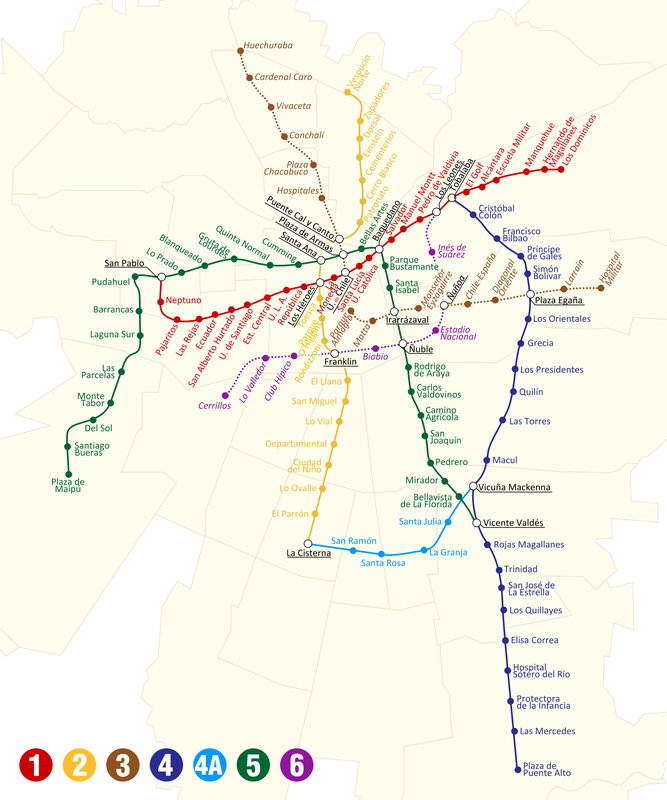 Map of Santiago Metro System showing various lines and stations. Click on the map to enlarge it or Download Santiago Metro Map in PDF.